Looking for a present for an Engagement or Wedding? One from the Groom to the Bride, Bride to Groom or from family and friends to the happy couple? Are you wanting to buy something truly unique that no one else will get? Why not give a keepsake box. A unique gift that can be kept forever. This beautifully designed keepsake box is perfect for anyone who treasures their memories. Perfect for keeping treasured items in such as photos, jewellery, love letters, invitations, to do list or just as a decoration. 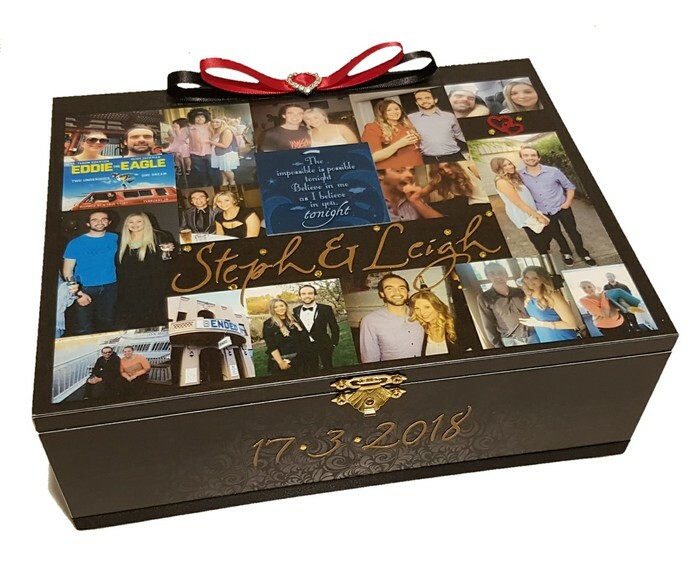 These keepsake boxes can be personalised with one or lots of photos from the happy couples life together and names, initials and dates can be added as well. This classically styled keepsake box is made from mdf and hand painted in a high quality black acrylic spray paint (no brush strokes). Inside colour can be changed upon request (ie: to match wedding colours etc). Decorated with a collage of your photos. Can be adorned with name, date, and embellishments. 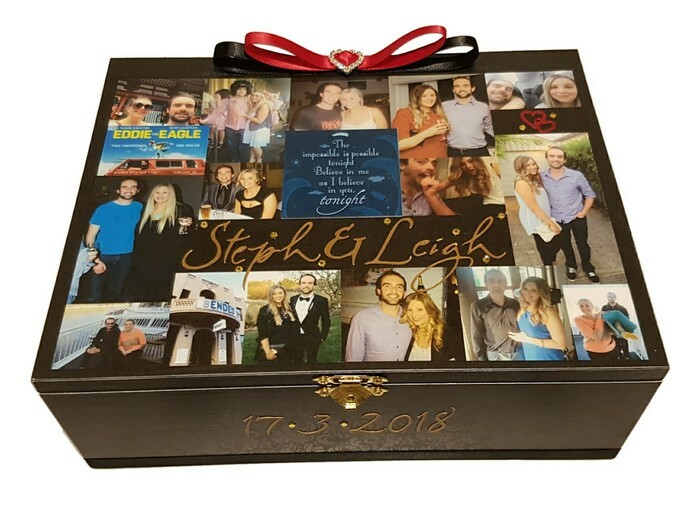 All images required for the photo/collage box can be emailed and I will arrange them into a design and print the image. A proof can be emailed to you. I do not use actual photos but a print of them. 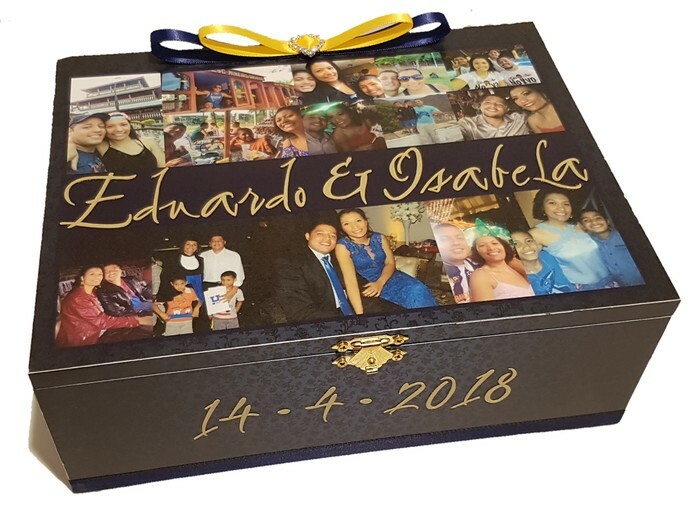 Photos can also be sent to me and I will scan them and then send photos back to you with the box. All images can be sent to: renayes.keepsakes@tpg.com.au or contact me for instructions. Need to be reasonably high resolution images. A rectangle box with hinges and latch. External dimensions: 24cm x 18.5cm x 8.5cm. Internal dimensions: 22cm x 16.5cm x 7cm. Please note that keepsakes boxes are designed as a decoration and not a toy. Please keep out of reach of children to small parts which may become loose if handled incorrectly and pose a choking hazard.